Preheat oven to 350. Combine flour, agave, flax, baking powder, nutmeg, and lemon juice. Whisk together non fat greek yogurt, coconut milk, and eggs in a large bowl. Stir dry mixture into wet. Add coconut oil, and mix to combine. Fold in blueberries and hazelnuts. If using paper cups line muffin tin with cups, if not spray with non stick cooking spray. Pour batter into each mold. Bake 25 minutes, or until toothpick comes out clean. Transfer muffins to wire rack and cook. 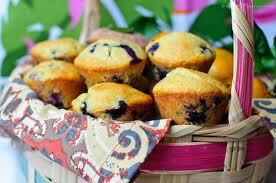 These are a great fiber and protein rich muffin with antioxidant blueberries. If you are looking for a low-fat, low-sugar, low sodium treat then this is just what you need.